Donald Trump and Hillary Clinton are running for President. Jill Stein (Green), Gary Johnson (Libertarian), Darrell Castle (Constitutional), and ten (10!) others will be on the ballot as well. Let me repeat: Donald Trump and Hillary Clinton are running for President, no one else. A vote for any other name on the ballot is wasted. A close friend told me they were going to vote their conscience in the primary. I assume they voted for Ted Cruz as they said they would—cute? Dumb. Clever? Foolish. Brave? Certainly not—we have a secret ballot here in California! Was I impressed by his bold claim? No, I was disappointed and fearful that he wasn’t alone in his choice. It would have been foolish to vote for someone who’d already pulled out of the race by the time Californians voted. I have heard this ‘vote my conscience’ statement quite a bit lately…from a lot of Christians. This phrase is part of the new CC—Christian Correctness®, quickly replacing Political Correctness. I’m not referring to Christianity. Christian Correctness does the same thing as Political Correctness: it pigeon holes the user, or better said, makes them part of the right club. It replaces real thought, straight thought, and ultimately, the truth with clever phrases and an unbecoming passive aggressive attitude. Ted Cruz and John Kasich, both men for whom I held a great deal of respect nine months ago, have proved themselves no more than sophomoric sour grape sore losers in the end, and might earn the dubious title as the ones who put Hillary in office. Hillary will be the first to thank them. “Dump Trump” and “Never Trump” are the clubs, the sorry self-righteous congregations of those embittered by not getting Ted, Marco or Carly nominated. And why such a nasty epithet—Dump Trump? He’s not like us! Look what he said about Megan Kelly, Ted Cruz and Marco Rubio. Donald Trump is not a politician (None of the founding fathers were politician, except perhaps Ben Franklin). Trump might not be good at running, or one might claim he’s too good; he won the nomination big time. I’m not sure why he said much of what he said that was so ugly, but he wants what I want, and I think he can bring it about. He isn’t PC in any way. He believes Christians have taken it in the shins for a long time, and if he’s not against you, he’s for you. If you vote your conscience, as recently constituted, you will get nothing in return. You will still have your pride…and that little sticker that says so proudly that you voted. One last word, if you’ve read the first 440 words. The pedestrian, pedantic, dismissive, insulting phrase “I’m going to hold my nose and vote for the lesser of two evils” is just plain nasty. Don’t use it. This seemingly clever phrase warns all those in earshot that they had better not cross the speaker, that it’s what we’re all doing, and that there is no thought beyond this (I’m avoiding conversations with many of my friends till December). It’s time to grow up. Your vote is precious, don’t waste it. It’s not a game. A six-year-old girl came into McDonald’s with her thirteen-year-old brother and her dad. Dad went to order lunch and the little girl claimed the table facing me, at a window. Her brother shot past to the second table behind me. He hollered for his sister to follow. “I want to sit here,” she said firmly, though not really defiantly. I thought, “Good for you. Hold your ground.” I was really proud of her, such a little thing up against a big lard-of-a-brother. “She should do well.” It made me smile. Dad had seen this. His approach even startled me. And he lit into his little girl. “Just who do you think you’re talking to? That’s your big brother. You do what he says!” And, blah, blah, blah. He stood two feet from me, and I felt like he included me in his berate. The second he raised his voice she was reduced to a quivering chihuahua. Her eyes darkened, her chin dropped to her chest—tail between her legs, and she was done. She didn’t dare cry—there wasn’t a hint of tears—that lesson had obviously already been taught. She crept off toward her brother. My brain screamed. “Some day a boy will tell her what to do, and she will do just as she is told.” And whatever the outcome, she will be blamed. So, listening to her brother at that time meant that he must always be in charge—regardless. And, following this logic, the big brother most likely learned he can count on being in control: he makes the rules! Hey, in a couple of years he can just tell a girl what to do, and she’ll do it. You don’t agree with my simple inferences of this two-minute scenario? Just how do you think personalities are formed? How do you think people learn their patterns of behavior? I was proud of the little girl at the outset, then I watched her fall in line just as though Dad had pulled on her choke chain. I think about it once in a while, and hope she keeps that moxxy, that strength to hold out. It was unfortunate for the dad that I wasn’t a line-backer like Tim, a friend of mine. I might have had the casabas to tell the dad what I thought, what he’d just flushed away. He might have learned a different lesson…but then, I’m small, afraid of confrontations, and maybe a little dumb—what? Where did I learn that? I dropped one of my business cards on the sidewalk the other day. I reached down to retrieve it and came a finger’s reach from another calling card from the WPA, the Works Project Administration (originally the Works Progress Administration). It was created in 1935 to help in the recovery from the Great Depression. Buildings, bridges and school built by the WPA bear plaques as a remembrance of our recovery—a slow recovery that ended at WWII. But, sidewalk calling cards aren’t limited to government projects of coarse. On the brighter side, there are many more business cards stamped in the walks of my town. 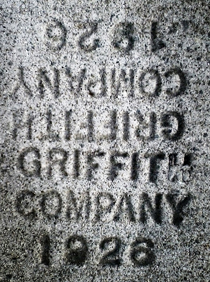 They were stamped by the contractors of 1950, 51, 52 and on. 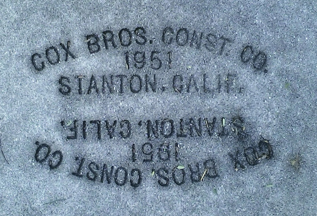 One of them was one of my Dad’s friends, Henry Cox of Cox Brothers Construction Company of Stanton, California. You can find his calling card in the 1951 neighborhood of East Whittier. Look for it on Ocean View above Mar Vista. Hank Cox was around our house a lot. He lived in Garden Grove where I grew up. My father, a broker, acquired property for Hank to build homes on. There were many independent contractors who poured the sidewalks in Whittier. They built the houses and the buildings.